Figured I'd go ahead and start a new official thread on this. It's going to have underground parking too! There is a link to the full document on InnerLooped. I think the parking garage is essential for the area. Hope this comes to fruition. 140 spaces? Three levels down isn't it? Kinda makes me wonder if that is going to be enough spaces. If it reaches capacity quickly, look for other developers to include sizable public garages in their plans. This isn't a private project though, right? Is this just a proposal or has it been finalized? This is going to be great for Midtown. It's right on the rail line and will help attract more development to Midtown like Discovery Green did for downtown. Does anyone know if Camden is building their apartments also? or is the parking taking up the entire superblock? I believe the parking is under Midtown's portion of the block. I'm with infinite jim. This is like a Discovery Green part II. We need something a little more interesting and swanky this time around like in Uptown Dallas and maybe a Victory style development. How much of the "Super Block" will the park take up? "Swanky" sounds expensive and more $$$ to maintain. 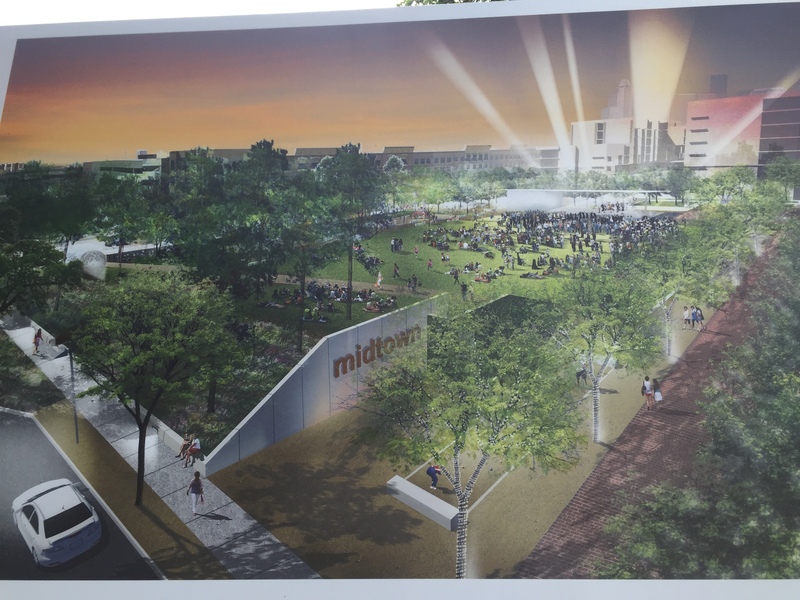 I think this rendering looks awesome because it fills a need for the area, brings in more retail and green space, and probably won't be a money bucket for Midtown (my tax dollars) to maintain. It should also spur development on the other side of Main. Seems like a win all around to me. A Victory style development is just about the last thing Houston needs. I remember it. Problem with it is that it assumes Midtown owns the entire Superblock (which it doesn't). Brian, what is the total estimated acreage for this park? 1.5 acres? How can that possibly be the case? That land must be at least 200-225' by 1,000' - roughly five acres. 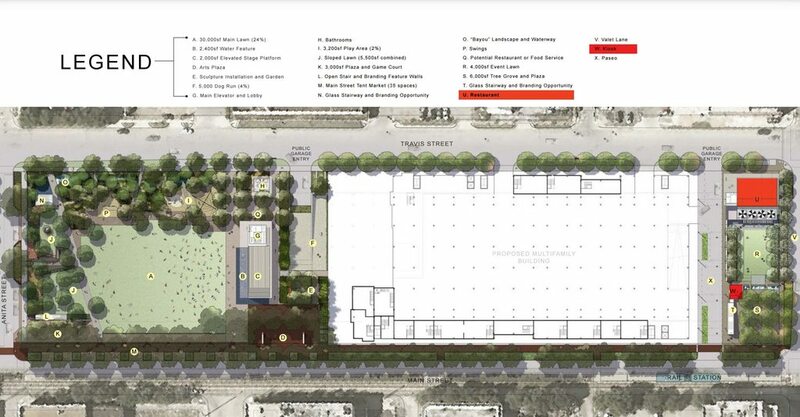 Is the entire contiguous space not being developed into the park? As nice as this park project sounds,1.5 acres really isn't large enough to make an impact as the 11 acre Discovery Green did. Remember that Discovery Green was built with nothing around it other than the convention center. This park will finally bridge the East and West sides of Midtown. In other words, people will now be encouraged to walk from Reef, over to Leon's (or Mongoose vs Cobra coming soon)... or over to Nouveau, etc. In other words, this park will fill the empty gap in the middle of Midtown and encourage people to stop seeing Main street as some border you can't walk across. It doesn't have to be enormous... it just has to have lighting, people, some restaurants, and green space. Plus, it's right at a light rail stop. I like the basic programmatic elements (like parking) but let's hope that they hire a different landscape firm than the designers of Market Square and Brown park. It just looks like the city is in the tank for certain firms (not naming names but w/r/t the rendering). Those are good parks, but what's the point of going here if it's just going to be another "consumer park?" Why a museum, library, or sculpture park? Why any of these things? Why not create a simple verdant green with dynamic topo? Now is the time to ask these questions. What exactly is dynamic topo? Is that some kind of A/V setting on one of these newfangled 3D HDTV sets? Or is it that the soil content is modified so that topography changes at an accelerated rate compared to the natural soil over geologic time? Perhaps it means that there are actuators under the surface? Gigantic subwoofers that generate minor earthquakes at random intervals, just to keep people on their feet (and off the park benches)? Or is it a swimming pool filled with green jello? That would be verdant, green, and dynamic...so long as verdant green isn't anything at all like soylent green...let's not have that, shall we? A "simple verdant green" sounds an awful lot like a vacant lot. One of the reasons that Discovery Green has been succesful is that it was heavily programmed and has maintained a steady, almost daily stream of various events. ^Brown Park is not a neighborhood scale park; it's a park for tourists/conventioneers and for the greater metro region. This is ~1.5 - 3 acres, how much programming is feasibly possible and worth it? I cannot for the life of me think of a single thing About Victory Park that should be emulated in Midtown. Midtown is actually successful. There are actual people living in Midtown. Victory symbolizes everything about how to do something wrong. Victory is Defeat. To even suggest Victory while discussing a park leaves one scratching one's head. With the younger demographic of Midtown I would like something recreational like some volleyball courts, basketball, and/or some basic fitness related equipment. Lets skip the whole family park idea with Midtown. Verdantly green jello wrestling... I like it. Mud pits divided by volleyball nets with a dress code...requiring verdantly green bikinis... I like that too. Pretty much every apartment complex in Midtown has this stuff already so I'm not sure if it would be fully utilized. Midtown had a public forum at HCC last year where they did a study on programming options. One thing they determined was that residents near the middle of Midtown needed and wanted open green space that was a little closer than Baldwin Park. I walk to that rail stop and use it all the time -- in fact, today. I cry a little on the inside every time I look across at the giant empty super block. Very excited to see this; hopefully this and the new Arts complex are "real." Baldwin park is nice, but I think it is a little too "plain." I guess more "Union square" than "Memorial park." Part of the urban fabric, not just a patch of grass with a playground and softball field. Agreed. Put slightly differently (at least, in my interpretation): More plaza, less park. I think that's a better option for this space. I agree with both of you and would submit the idea of an adaptable multi-use space should be a consideration. Perhaps something like a sculpture garden with some kind of running water, but that's open enough that it could double as a small amphitheater or open air market on the weekends. He's probably talking about all the flashy things Victory Park has like the jumbotrons and stuff. lol. In his defense though, he also mentioned Uptown Dallas as a suggestion. But i think Simbha put it best: More plaza, less park. I'm happy that Houston's trying to increase its green space, but to slap a patch of grass on everything in every part of town (especially urban environments) can get a little boring. I'm guessing that's what C2H was "trying" to say, but failed misearbly the moment he mentioned Victory Park. Yeah, I agree with the idea of having a plaza. In fact, this could easily become a signature space for Houston, being along the rail line and in the middle of an important, developing and central area of the city. Something along the lines of a bricked space with fountains and minimal statuary. Because I visit Spain very often, and have a place in Barcelona, I'll refer to the Plaça de Catalunya (Plaza of Catalonia) as the archetype of is being suggested: a central space with fountains, benches, etc that has multiple uses, including the potential for small concerts/festivals. I'd think that area developers would get behind such an idea, as it would likely increase the value of their properties significantly. I don't know much about how these things work, but if someone could direct me to a meeting where I could voice my opinion on this, I'd be happy to do so. If it's a plaza, don't let the City get anywhere close to it. Jones Plaza was a great place until it was "improved". We went there every week. Now, it's a boring palce with no redeeming qualities. What complexes do have are pools and fitness equipment, I haven't been to or heard of any with volleyball and bball courts in Mditown. My initial thought was a public swimming pool: throw in a lap pool, main pool w/diving boards, a splash pad for the kiddos, and some small slides. However, almost every large complex has a pool. Well if the people want more open green space then I can't argue with that though. Yeah, that sucked. I'm not against open-air performance venues AT ALL - but I wish the city maintained the existence of true plazas in its central core. How about tennis courts and a driving range? Midtown people are active, let's give them something to do in their own neighborhood. Normally, you have to drive to Memorial for these things and it's always packed. I'm personally opposed to this, and I live in the vicinity of this space. Tennis courts and driving ranges are only enjoyable by a relatively small proportion of people, and then only in limited numbers at a time. For example, a driving range would need to be at least 600 feet in length (probably more) - most of which is open space taken up by lawn and green... unusable by people directly. I'd rather see a plaza that can directly be utilized by relatively large groups of people simultaneously. After looking at the rendering, it basically looks like one city block with an open field, trees surrounding it, and some very small, shallow pools. I'm not expecting much from this as far as the park itself. The retail space will make the area nicer though. My comment isn't about the rendering - but rather what should be done with the space. For tennis there's emancipation park (taft and dowling), I think there's 3 courts, they are well kept and I've never seen more than 1 in use at a time. For driving range there's gus wortham, because it's over on lawndale and wayside no one knows it exists, so the driving range is always available, and of the people I know who have played there, only 1 didn't find the course to be one of the most enjoyable they've played (public course anyway). Wortham is a great layout. It was orignally built as Houston Country Club. Yes! This is my go to course! Never too crouded, cheap (like 25 with a cart last time I went), and there is a mexican guy on Wayside that will sell you like 40 golf balls for 7 bucks! "That’s precisely what the Midtown Redevelopment Authority and Camden Development Inc. plan for about half of the 3.5 acre site. Maybe METRO will contribute towards a memorial here too! Does anyone have any more info on this? I'm extremely excited about this, a nice park will help draw development around the area. I think the likliest action will be to attract a couple hundred more homeless/vagrants.